Even for an independent rapper with more projects under his belt than years he’s been alive, 2013 proved to be a period of unparalleled critical success for Starlito. The Nashville emcee released two solo albums this year, Cold Turkey and Fried Turkey, the latter of which reached number one on Billboard’s “Heatseekers Albums” within a week of its debut. 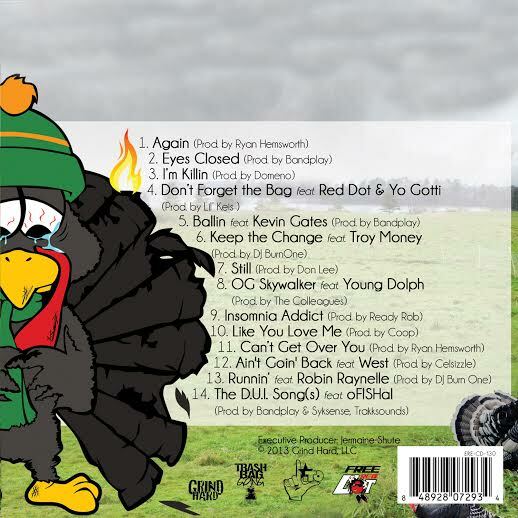 In addition to making appearances on mainstream charts, the underground’s “neighborhood hope dealer,” turned the release of his sophomore LP into a philanthropic event—co-sponsoring the 100 Dreams Turkey Drive in his hometown and hand-delivering Thanksgiving poultry to the less fortunate. And while a surprising number of hip hop artists seemed to crumble beneath the omniscient gaze of Internet Age multiphrenia this year, Starlito just got smarter. The proof is in the Fried Turkey. Where Cold Turkey is concerned with the negation of negativity, Fried Turkey is a mélange of ideologies that fuses Afrofuturist elements with Surrealist ones and balances their obliqueness with the concreteity of trap narrative. What softens the sharp edges of Starlito’s straight-edge storytelling this time around is that he surrealizes many of his stories: telling them through psychedelic lenses of kush, codeine, and insomnia. Instead of a static speaker who remains ideologically unchanged for the duration of the album, Fried Turkey’s speaker “plays mas”: shifting between identities at will and re-imagining poetic and sociopolitical modes of expression. In her essay, “Afrofuturism and Post-Soul Possibility in Black Popular Music” Marlo David explains: “Contemporary black artists now possess relative freedom to “play mas” with identity. To “’play mas’ affords… the mobility to shift personae in ways that counteract the limitations of identity imposed by the hegemonic gaze…” (697). Literally, “playing mas” refers to the wearing of costumes in Afro-Caribbean carnival tradition; but for a confessional rapper like Starlito, it’s all about employing multiple personae and complicating notions of authenticity by presenting facets of his true, complex self as separate static identities that, by the end of the album, converge. The speaker uses this instance of what Michael Eric Dyson calls “the hip hop version of ancestor evocation” (eulogizing the deceased by calling his / her name on record) to fuse his own cosmology with Shakur’s, writing (or rapping) himself into a collective hip hop memory using his agency as black / poet / rapper to do so (228). In a similar vein, “Keep the Change” could be subtitled “The Tupac Response” since it creates an intertextual dialogue with Shakur. Like “Eyes Closed,” it takes place in a surrealist state (the speaker is “sippin’ pink”); but instead of directly addressing the slain rapper, it begins with the opening line of Shakur’s “I Ain’t Mad At Cha” that says: “Change…I guess change is good for any of us.” But in “Keep the Change,” the speaker respectfully disagrees with Shakur’s assertion on the subject of “change” and responds with his own philosophy on the matter: “I tell em’ keep the change.” In doing so, the speaker defies traditional rhetorical modes of rap elegy that insist exchanges with the dead be linear, non-culpatory, and parallel to the ideology of the deceased. “I’m bout it bout it,” references a 90’s Master P cut of the same name, while “master kush” is a New School term. Traditionally, age is the determining factor in OG classification; but here, the speaker declares himself an OG on the basis of what he smokes. And at the core of the hood body politic, what you smoke is a byproduct of “hustle”—the success of which depends on how well you employ OG attributes like wisdom and stealth. In other words, despite his young age, the speaker’s hustle has earned him the right to a certain level of respect. In addition to engaging in a long standing hip hop tradition—getting “lifted” and rapping the experience—the speaker is challenging traditional methods of OG induction that would prevent younger individuals from earning their “OG Degree,” and the respect that comes with it, based on age alone. And by amalgamating linguae, the speaker effectively creates a “young OG lexicon”: a combination of old and new. The more trap oriented productions like “I’m Killin,’”“Still,” and “Don’t Forget the Bag” offer a concreteity that balances the abstraction of the album’s surrealist thread. In these records, the speaker is engaged in physical activity—not just internal juggling. He is an active member of the trap he flows about and is most concerned with capturing “trap truths” on wax. Consequently, these records are Afrofuturist by nature. The speaker wants to create personal accounts of trap life that will survive into the future. And instead of clichéd renderings of ghetto experience, the speaker asserts himself as part of a regionally specific “dope boy intelligentsia,” using local dialect to compose dramatic situation instead of popularized trap terms made passé through mainstream use. For example, in “I’m Killin,’” the speaker explains that “Four racks” will buy “some daffodils.” “Daffodils” (which, according to Lito, is a “pound of flowers”) is not a popularized trap term, but one that is regionally authentic. Mainstream journalists fell in love with Starlito this year. He appeared on Sway in the Morning and interviewed with Complex who also named him on its list of “13 Most Underrated Rappers Right Now.” But Mr. Shute is not “underrated” as much as he is underestimated. Though he’s become the undisputed southern underground “people’s champ,” he’s often snubbed by hip hop media proper because he’s militantly independent. Because he’s not easily categorized by the one dimensional rap rubric used to “grade” mainstream artists too stuck on materialism to offer nuanced social commentary, too narcissistic to pay homage to the hip hop forefathers they relentlessly mimic. The truth is, bubblegum-pop rap critics don’t expect to glean a lesson in Afrofuturism, Thug Surreality, and street semantics from a 29 year old low-down dirty south rapper. And while they continue looking to mainstream for a New School zeitgeist, we, the underground, place our bets on Starlito. David, Marlo. “Afrofuturism and Post-Soul Possibility in Black Popular Music.” African American Review 41:4 (Winter, 2007): 695-707. Dyson, Michael E. Holler if You Hear Me: Searching for Tupac Shakur. New York: Basic Civitas, 2003. Print. Shute, Jermaine. Fried Turkey. 2013. Sound recording.